I feel like a bit of a slacker – I try hard to do my due diligence in resto research… so HOW (up till this point) I’ve missed one of the BEST restaurant openings of the past year (March 2010), is beyond me. Taking into account the space/atmosphere, value and overall deliciousness of Brindle Room – I’m confident in recommending this new-ish East Village (10th btwn 1st Ave/Ave A) gem serving up New American Cuisine. Walking in, I first noticed the dark wood paneling and dim lighting paired with junior bar-stool seating; the whole place has an air of modern rustic refinement. The restaurant itself is a deep, narrow room; there’s nothing cramped about the space arrangement, but I’d probably cap my dining party at 4; this really isn’t a spot for groups. The waitresses – we had 2 frequenting the table – impressed us with their knowledge of the menu offerings. They set us up with cardboard mounted menus, which are an expanded version of the website menu, and then quickly grabbed us 2 craft brews – the Genesee ($4) and a Smuttynose IPA ($7). 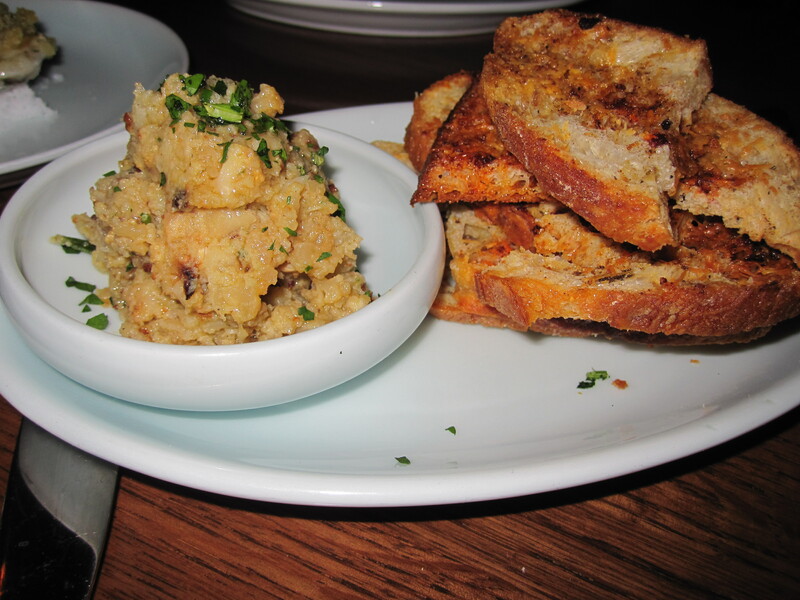 We started with the Cauliflower Spread ($6), rich with garlic + oil, and served with a side of crispy toast that was baked with parmesan and paprika in each cheesy bite. Both items were amazing and together were a great spread/dip pairing. 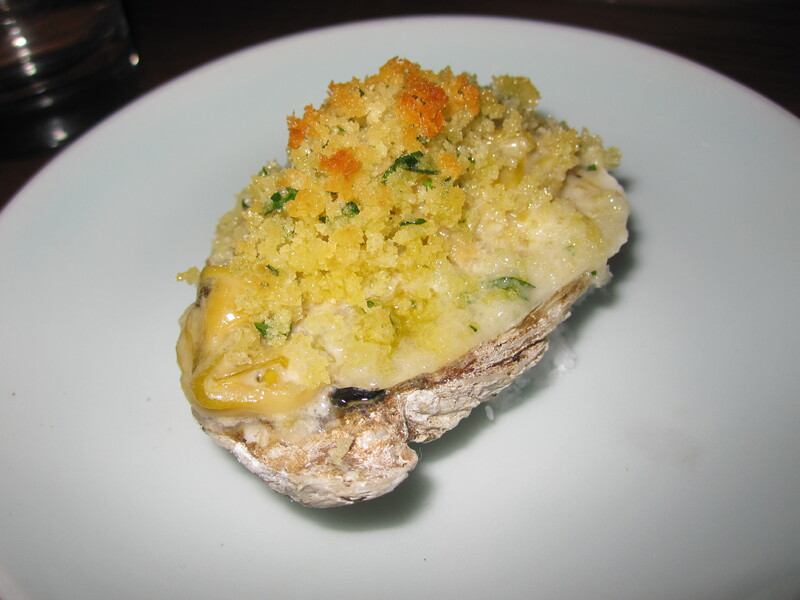 Next up: a Baked Oyster ($3 each) – my very first Oyster, lightly baked and topped with creamed leeks + bread crumbs. Such a stellar first experience; I want more! NOW! 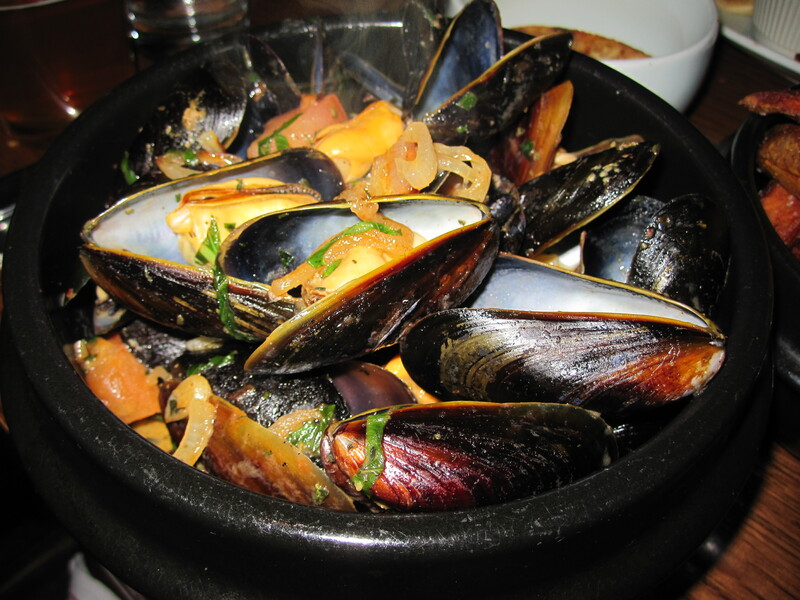 I was also THRILLED to find Moules Frites ($14) on the menu – t’was a large portion of pretty big mussels in a spicy tomato and garlic broth with just a touch of dairy. I’ve been on an absurd mussels bender of late and these were the BEST I’ve encountered yet. 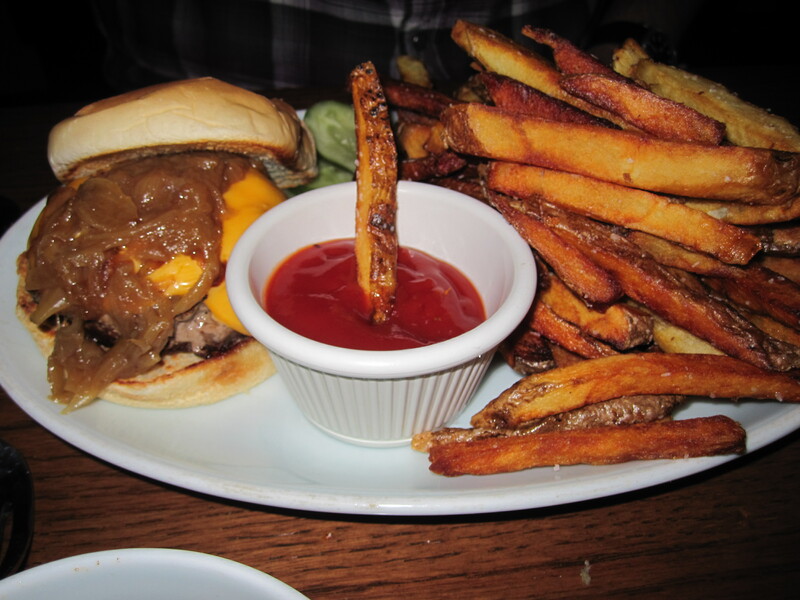 My dinner date had the Steak Burger ($12) w/melty American and caramelized onions – he said it was an impressive burger, but wished he asked for it a little less done (he ordered it medium). Both our meals came with massive portions of well-salted steak cut fries that I could’ve should’ve done without, but were great nonetheless. Surprisingly, I got wind of this place when it showed up on NY Mag’s Best Donuts list – I’ll have to return for breakfast (it’s a separately branded menu called Wonder City Coffee & Donuts at Brindle) … Hopefully the service remains on point; I must say, one of my favorite things about the resto is how sincere everyone was when asking how we enjoyed everything. I was happy to report to them, and now to you all, that it was all wonderful. Really, if you’re looking for a great new-ish spot to try that’s easy on the wallet with foodie-approved eats – Brindle Room is the place to go. The deal just keeps getting sweeter; book your reservation through Savored for 30% off your total dinner bill Mon-Thurs!